'World of Dance' The Cut competitors The Rock Company. Photo by Trae Patton/NBC. The toughest round of World of Dance competition has finally arrived. Talented groups from all over the world battled through The Qualifiers, survived The Duels and will be fighting for the final three spots in their respected division during The Cut. During this first round, the judges acted as mentors, along with guest mentors of their choosing, to make sure each performance was prime for the battle of a lifetime. The Junior Teams division was first to compete against one another in hopes of securing their spot in the final round. Mentored by J-Lo and guest mentor Savion Glover, each junior team had the chance to leave their mark on the stage. First to hit the stage was Flip. As the only waacking team in the competition, Flip’s goal was to set the tone, and they certainly did. They brought more dancing into their routine, which added to their entertainment quality. They rocked the stage with their intro from a music standpoint by matching each sound of the horn section with intricate hand movements. Flip was crystal clean throughout their routine, and it was well received by the judges and audience alike. With a score of 88.3, they claimed the first place spot and hoped to secure that as the other teams performed. ‘World of Dance’ The Cut competitors Expressenz. Photo by Trae Patton/NBC. Expressenz brought a fairytale-like vibe to the World of Dance stage with their performance. They brought a great theme to their routine, as they were covered in butterflies, and the stage was sprinkled with leaves. Known for their intensity, Expressenz matched the build-up of the music within their performance. Their technique and lines were spectacular as they danced with great strength and synchronization. Expressenz also went the extra mile by taking their signature turn section to the next level by adding more difficulty in the sequence of turns and delivering a smooth transition to close their routine. They took the second place spot after scoring an 87.0. Bringing Paso Doble to the forefront was ballroom troupe The Pulse. They set the stage on fire with their performance from the moment the music started. There were some outstanding partnering elements woven throughout their routine, which was complemented by amazing cape work. The Pulse made great use of the stage as they moved as couples but made one unit. They showed great emotion with each element of their routine and gave an exceptional performance overall. After delivering a great performance, The Pulse crept into second place, knocking Expressenz into third place. ‘World of Dance’ The Cut competitors The Lab. Photo by Trae Patton/NBC. Next to the World of Dance stage was The Lab. Deciding to take a different path than their usual hard-hitting hip hop routines, The Lab’s performance was inspired by one of their teammate’s tragic experiences. They delivered a heartfelt performance that had a bit of contemporary mixed in. The Lab came through with the same precise movements, which were super clean. They brought raw emotion to the stage, along with great visuals, to bring a masterpiece to the stage. The Lab flipped the script on the competition, and it was a risk well taken as they grasped the first place spot, knocking Expressenz out of the competition. ‘World of Dance’ The Cut competitors Quad Squad. Photo by Trae Patton/NBC. Quad Squad took the stage next, hoping to bring something new to their contemporary style. They brought that same power that they showcased in the first two rounds, along with impeccable technique. There were some great visuals to Quad Squad’s performance as well, along with lasers as a surprise element. Their routine was something innovative and different than anything the judges had ever seen. But even though it was different in regard to Quad Squad’s usual style, the judges felt that the lasers distracted from their performance and that there was something missing. After scoring 86.0, Quad Squad will not be going on to the next round. Next to hit the World of Dance stage was The Rock Company. They were determined to redeem themselves from a rough Duels round, and they did so with grace with their contemporary routine. The Rock Company delivered a beautiful routine that set them apart from the other performances. Their transitions and technique were exceptional for such a young group, and they brought light to the stage with their authentic emotion. The story was well thought-out and translated on stage, which brought them back to the prime that they had in The Qualifiers round. After scoring a 93.7, The Rock Company knocked The Pulse out of the competition and secured a spot in the Finals. Destined to finish on top were the Fabulous Sisters. They chose a royal theme to their routine, as they were decked out in black and gold. The Fabulous Sisters showed unbelievable intensity from start to finish. Every move they made was intentional, and every element was executed beautifully. The formations and pictures created by the Fabulous Sisters were equally amazing as they went from one element to the next. “Fierce” is the best word to describe such a strong routine. The choreography was different than anything seen on the World of Dance stage, and it was a crowd-pleaser. The Fabulous Sisters’ performance proved to be great after they scored a 96.3, knocking Flip out of the competition. The three top Junior Teams moving on to the Divisional Finals will be The Rock Company, Fabulous Sisters and The Lab. ‘World of Dance’ The Cut competitor Michael Dameski. Photo by Trae Patton/NBC. The competition continued to heat up as the Upper Division performances went against one another in order to claim one of the top three spots in the Divisional Finals. With Derek Hough as a mentor and Julianne Hough as a guest mentor, the Upper Division would be equipped with everything they needed to perform at their best. First to the stage was Michael Dameski, the only soloist in the division. Michael danced beautifully throughout his routine. His performance was unexpected from one heart-stopping transition to another. He had a great mix of acrobatics followed by dancing, which made his routine magic. Michael showed authentic emotion that reverberated to the audience and the judges. With a score of 93.0, he held on to the first place spot. After redeeming themselves in The Duels round, ballroom duo DNA came with a more lyrical feel to their ballroom performance. They had beautiful partnering elements, along with smooth transitions throughout. DNA’s performance was almost like a dream sequence, and their chemistry was undeniable as the married couple created an amazing storyline that brought their routine together overall. 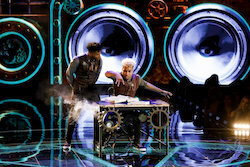 DNA received rave reviews from the judges and the audience as well. After receiving an 89.3, DNA took the second place spot. Alisa and Joseph brought their urban dance style to the World of Dance stage. Their routine was full of infectious musicality, and they showed great interaction with each other. Alisa and Joseph served footwork that didn’t quit with a whimsical feel to their choreography. Their performance was charming overall and landed them the third place spot with a score of 86.3. ‘World of Dance’ The Cut competitors BDash and Konkrete. Photo by Trae Patton/NBC. BDash & Konkrete were next on stage and destined to top their performance from The Duels. They created magic with the use of their props and accented that with unbelievable isolations. BDash & Konkrete’s storyline was brought to life from start to finish with some surprise elements mixed in. BDash & Konkrete also delivered clean movements, which was a highlight of their performance. The judges gave their performance a standing ovation and gave BDash & Konkrete a score of 91.0, which knocked Alisa and Joseph out of the competition. Next to hit the World of Dance stage was Marinspired. This duo brought something new to the stage with a quirky yet innovative contemporary number. Their musicality was great, along with the choreography, which created a narrative that was executed perfectly. Marinspired delivered the same flawless technique that they have for the past two rounds and showed great strength throughout each element in their performance. Although they brought something new to the table, it was not enough to continue on to the Divisional Finals. Zack and Ashley brought a performance inspired by one of Zack’s friends who passed away. This duo brought raw emotion to their routine, and it continued to build. Zack and Ashley danced in a way that was beautiful, elegant and effortless all in one. Their technique was out of this world as they delivered a stunning point that flipped the focal point to Zack rather than Ashley. There was a vulnerability to the performance that made it 10 times more emotional, and it touched the judges as well as the audience. After scoring a 91.3, Zack and Ashley bumped DNA out of the competition and claimed the second place spot in the Divisional Finals. Karen y Ricardo closed the night with a slower routine as opposed to their other two performances. This was a risk but one that proved to be a great one. They still brought fire to the World of Dance stage but allowed for their ballroom technique to come through. Every movement from Karen y Ricardo was electric, and the various lifts and other partnering elements added even more to their routine. There was more movement incorporated throughout Karen y Ricardo’s routine, and they delivered a crowd-pleasing routine overall. With a score of 99.0, Karen y Ricardo claimed the first place spot, followed by Michael Dameski in second, and Ashley and Zack in third. The Cut round is far from over as even more talented dancers take the stage to prove why they should move on to the Divisional Finals. You won’t want to miss it! Tune in!